In this photo provided by the U.S. Navy, a Russian Sukhoi Su-24 attack aircraft makes a low altitude pass by the USS Donald Cook in the Baltic Sea, April 12, 2016. (by Phil Stewart, Reuters) – Two Russian warplanes flew simulated attack passes near a U.S. guided missile destroyer in the Baltic Sea on Tuesday, the U.S. military said, with one official describing them as one of the most aggressive interactions in recent memory. 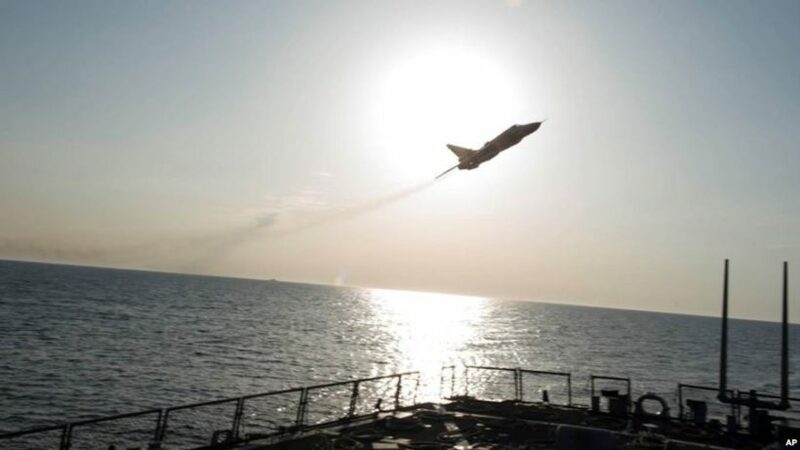 The repeated flights by the Sukhoi SU-24 warplanes, which also flew near the ship a day earlier, were so close they created wake in the water, with 11 passes, the official said on Wednesday. The planes carried no visible weaponry, the official said. A Russian KA-27 Helix helicopter also made seven passes around the USS Donald Cook, taking pictures. The nearest Russian territory was about 70 nautical miles away in its enclave of Kaliningrad, which sits between Lithuania and Poland. “They tried to raise [the Russian aircraft] on the radio but they did not answer,” the official said, speaking on condition of anonymity, adding the U.S. ship was in international waters. The U.S. military on Wednesday released photos and videos of the incidents. In one photograph, an SU-24 appears to pass at extremely low altitude over the Donald Cook’s bow. The events were reminiscent of the Cold War, when a series of close calls led to a bilateral agreement aimed at avoiding dangerous interactions at sea that was signed in 1972 by then-Secretary of the Navy John Warner and Soviet Admiral Sergei Gorshkov. The incident came as NATO plans its biggest build-up in eastern Europe since the Cold War to counter what the alliance, and in particular the three Baltic states and Poland, consider to be a more aggressive Russia. The Baltic states, Estonia, Latvia and Lithuania, which joined both NATO and the European Union in 2004, have asked NATO for a permanent presence of battalion-sized deployments of allied troops in each of their territories. A NATO battalion typically consists of 300 to 800 troops. Moscow denies any intention to attack the Baltic states. “We cannot treat this as anything else than provocation, yet another example of aggressive intentions towards NATO, towards the United States, towards Poland,” Poland’s Defense Minister Antoni Macierewicz told private radio RMF. The USS Donald Cook had just wrapped up a port visit in the Polish city of Gdynia on April 11 and proceeded out to sea with a Polish helicopter on board. The first incident took place on April 11, when two SU-24 jets flew about 20 passes near the Donald Cook, coming within 1,000 yards of the ship, at about 100 feet in altitude. That was followed by even closer passes by the SU-24s the following day and the passes by the Russian helicopter. “These actions have the potential to unnecessarily escalate tensions between countries, and could result in a miscalculation or accident that could cause serious injury or death,” it said. Washington has raised its concerns with Moscow over Russian jets that earlier this week passed close to a U.S. destroyer in the Baltic Sea, the White House said on Thursday. (Additional reporting by Andrea Shalal in Washington and Wiktor Szary in Warsaw.) Reprinted here for educational purposes only. May not be reproduced on other websites without permission from Thomson Reuters. Visit the website at Reuters.com. 3. How did a U.S. military official describe the incidents and official reaction from the USS Donald Cook? 4. a) What was the Cold War? b) How did incidents such as this end during the Cold War? Be specific. 5. What did Obama spokesman Josh Earnest say about the Russian aggression? 6. How does Poland’s Defense Minister Antoni Macierewicz say the incident should be viewed? 7. What response does U.S. Representative J. Randy Forbes, who chairs the House Armed Services subcommittee on seapower, say we should take? a) What do you think Vladimir Putin’s motive was for this action? Please explain your answer. b) Which presidential candidate: Clinton, Sanders, Trump or Cruz do you think would be able to best deal with President Putin of Russia? Please explain your answer.